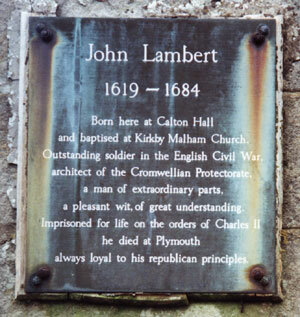 Born in Calton, John Lambert is one of Malhamdale's celebrated historical figures, famous for the part he played in the English Civil War. When the first Civil War broke out he first proved his worth in Lord Fairfax's Parliamentarian Northern army, showing his tactical ability and bravery whilst fighting at Hull and Nantwich. His reputation as a soldier steadily increased, and he was second in command when he led his regiment of horse at Marston Moor in 1644. In 1645 he took over Fairfax's position as commander of the Northern Army, but was wounded at Wentbridge later in 1645. He also had considerable diplomatic and organisational skills, which were to prove useful in 1647 when the army struggled against the will of the Parliament to disband part of the army. He was closely involved in the politicisation of the New Model Army, which led to the trial and execution of King Charles I in 1649. He returned to his command of the Northern Army and was second in command to Cromwell at Preston and when they crushed the northern resistance at Pontefract. Promoted to Major General, Lambert was Cromwell's second in command when he marched into Scotland in 1650 and temporarily took command when Cromwell fell ill in spring of 1651. Later that year he helped slow the Scottish advance at Preston, before going on to attack Worcester. The end of the wars found him involved in politics and Parliament nominated him Lord-Deputy of Ireland, but then abolished the post and he refused a lesser position. He supported Cromwell when he dissolved Parliament and wrote the Instrument of Government, Britain's first and only written constitution, to be applied when Cromwell became Lord Protector in 1653. He was a prominent supporter of the Army's power and the creation of the Major Generals who ruled England in 1655. A rift started to form between Lambert and Cromwell and he refused to take the oath of loyalty to the Lord Protector or countenance him as King in 1657. He resigned his commission and retired to his house at Wimbledon with Frances and his ten children to "grow flowers". After the death of Oliver Cromwell, Richard Cromwell tried to take his place, but was forced to resign by Parliament. Lambert re-emerged into politics, becoming MP for Pontefract and Parliament reappointed him to his command in the army. However things were still very unsettled and in 1659 he marched with the army into London and dissolved Parliament. General Monck the commander in chief for Scotland supported the Parliament so Lambert marched against him. Most of his troops deserted and he was arrested and imprisoned in the Tower of London in 1660. 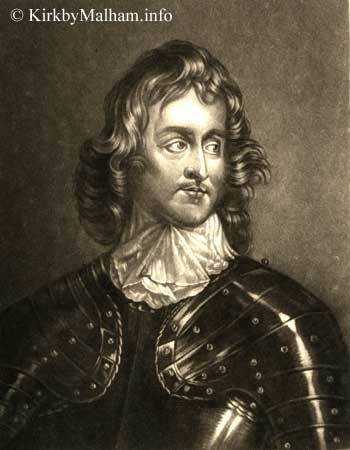 He escaped and tried to rally his troops at Edgehill, the last republican stand against the Restoration of the Monarchy, but he was again captured and in 1662 was tried for high treason and sentenced to death. This was later commuted to life imprisonment by Charles II. He was sent to Castle Cornet, Guernsey, then moved in 1670 to Drake's Island in Plymouth Sound where he died in 1684. 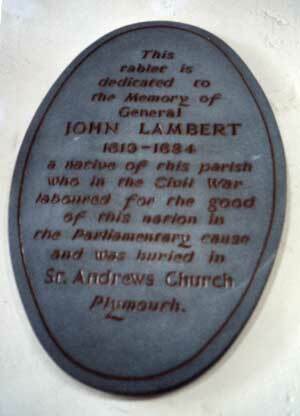 The Lambert family and Major General John Lambert : History on Andy Lambert's website. also David Fell's Lord Lambert website. For More information about the Civil War, try the British Civil Wars & Commonwealth website, the BBC/ Open University Civil War pages, BBC History , or the Boise State University pages. Again there are plenty more if you run a Google search. Malham Village Hall was packed to hear Dr. David Farr’s talk on the remarkable career of John Lambert of Calton, a man who rose from the minor gentry in a remote corner of Yorkshire to become the second most powerful man in Britain in the mid seventeenth century. The family fortunes which had grown large following the dissolution of the monasteries, were in serious decline in the early 1600s. Dr. Farr eloquently described how John Lambert’s rise was attributable in large part to his close family links, and most significantly to his marriage to Frances Lister, daughter of Sir William Lister of Thornton. Through the Lister family he was related to Lord Ferdinando Fairfax of Denton Hall, who commanded the Northern Association Army at the start of the Civil War, and his son Sir Thomas Fairfax who later commanded the New Model Army. Lambert was prominent in many battles and sieges, and made a massive contribution to the parliamentary victories in the north, including the siege of Hull and the Battle of Marston Moor, ‘Bloody Preston’, the successful campaign against the Scots and the final royalist defeat at Worcester. The war propelled him into a position of power and wealth, until in the autumn of 1653 he retreated to his home in Calton where he wrote Britain’s first and only written constitution, ‘The Instrument of Government’, under which Cromwell governed as Lord Protector until 1657. Under this constitution, the position of Lord Protector was elected and not hereditary and his power was severely limited in that generally he had to act only with the advice of a Council or Parliament. He could not make laws, but only give assent to measures passed by Parliament. Parliament’s approval was needed for changes to taxation and in the event of war, Parliament had to be summoned immediately. The franchise was to be available to men with more than £200 per year and freedom of religion was to be allowed within certain limits. The Instrument of Government foreshadowed by more than a century the constitution of the United States of America, to whose shores generations of Puritans had fled persecution in this country, seeking political and religious freedom. Henry Ireton and the English Revolution published by Boydell Press, 2006: and many articles on the Civil War. Born 7 Sept 1619 at Calton Hall in the parish of Kirkby in Malhamdale, John Lambert was the son of Josias Lambert. His great grandfather John Lambert (-1569) having moved to Calton/Airton and founded the Malhamdale family by adding house to house, land to land he established, at Calton, a sound economical and social formation. He held many crown offices - Vice Chancellor of the Duchy of Lancaster - Receiver of the King (Henry VIII (1509-1547) - JP etc. He was in favour with the Commissioners appointed for the dissolution and appropriation of religious houses, it enabled him to acquire land which belonging to the monks of Bolton Abbey in Malhamdale. Settling in Malhamdale he seems to have purchased no fewer than ten manors in or about. Baptised in Kirkby Malham church on 7 Nov 1619, he attended Kirkby Malham school founded by Benjamin Lambert of Airton Hall. It was pulled down about 100 years ago. When he was 13 years old his Father died. Attended either Giggleswick or Skipton Grammar schools, both were 16th century foundations. It is thought that he went to Cambridge University as a pensioner (not assisted). Registers for Christs and St. Johns record a John Lambert together with many Giggleswick names. He did not graduate. He is said to have studied law at the Inns of Court, the likeliest being Middle Temple where two of his ancestors where among its members. Marriage brought him relationships with Sir Henry Bellasis of Newborough in the North Riding of Yorkshire, a Royalist and the Fairfaxes of Denton in Lower Wharfedale, a Parliamentarian who he was destined to fight alongside later. James Maleverer of Arncliffe ( 1618 approx), a large landowner refused to be made a knight of the shire and to pay the King (Charles I) dearly for this unsought of honour. For refusing this honour he was find £2000 for contempt. Sir David Foulis, a county leader of the popular party of the day was indicted for commending Maleverer's example and described him as "the wisest and worthiest man in the county" and "a brave spirit and true Yorkshireman". He was imprisoned at Fleet, fined £8000 and deprived of public office. Maleverer& Foulis became active and zealous adherents of the Parliamentary cause. its sessions, dissolve it at will, control the nations defensive forces, crown supremacy in the government of the church. Attempt made by the King on 3 Jan 1642 to arrest five members of parliament in the House of Commons brought events to a head. King removed himself to Hampton Court, then to Windsor, then to York within four weeks. His wife sped to Holland with the best of the Crown Jewels. in July with a large body of troops but was repulsed. In the summer of 1642 he admitted that Yorkshire failed to meet his expectations and set up court in Oxford. In order to find out what was happening in the royal court five commissioners were sent from the Houses of Parliament in London. The King received them ungraciously and ordered them to appear in two days time and warned them that if they "hindered his service" he would clap them up. At the meeting a large number of the gentry appeared but freeholders were not allowed to attend. To all Captains, Lieutenants and all other officers and soldiers within the liberties of Craven: These are to charge and require you and every of you that you forebear to enter the house of Edward Parker of Browsholme Esq by might to take away horses or other goods from him either within the house or without the house either by night or day, without special command from me, as you and every of you will answer the contrary at your peril. Given at Giggleswick under my hand the 19th day on December 1643. Lambert was involved in the siege of Skipton Castle. Feb 1643 The Queen, Henrietta Maria, landed at Bridlington with a number of French,Walloon and other foreign troops plus a large store of ammunition all paid for by selling or pawning the Crown Jewels. Parliament appealed to the Scots for assistance with a result of negotiations which in Sept 1643 to the conclusion of the Solemn League and covenant by which the English Parliament was to supplant Episcopacy by Presbyterianism. Oct 11 1643. Colonel Lambert was said to have carried himself very bravely in the sally from Hull. Jan 19 1644 Alexander Leslie, Earl of Leven, crossed the Tweed into England. Jan 25 1644 Praised by Sir Thomas Fairfax for his services with the parliamentary horse at the battle of Nantwich. March 1644 Lambert and his regiment were quartered at Bradford. March 5 1644 He beat up the Royalist quarters and took 200 prisoners. A few days later he repulsed an attempt by Colonel John Bellasis, the Kings governor of York, to capture Bradford. 1645 When Parliament sent for Fairfax to command the New Model Army, Lambert, now a Commissary General of Fairfaxes took charge of the forces of the North during his absence. The appointment was only temporary as Colonel Poyntz was ultimately made commander. Jan 1646 Command of a Foot Regiment in the New Model Army. March 14 1646 One of the negotiators of the treaty of Truro and the capitulation of Exeter and Oxford. It is evident that he was, from the first, regarded as an officer of exceptional capacity and especially selected for semi-political employment. March 1647 End of the 1st. Civil War, discontent simmering in the army regarding arrears in pay and other grievances. 40,000 troops sent to Ireland and the rest sent home. 1647 Dispute between the army and parliament brought Lambert into greater prominence. Lambert acted as spokesman for the discontented officers of each regiment into a general summary of army grievances. With Ireton he drew up the "Heads of the proposals of the army"
July 1647 Soldiers of the Northern Army threw in their lot with the New Model Army, seized General Poyntz and sent him as a prisoner to Fairfax. Aug 8 1647 Lambert took over command of the Northern Army at Peckfield Moor. May 1648 Northern Royalists took up arms again. Lambert held his own against the forces of Sir Marmaduke Langdale forcing him into Carlisle and recapturing Appleby. July 1648 Scottish army under Hamilton invaded England. The advance preceded by the defection of Pontefract (1 July) and Scarborough (28 July) obliged Lambert to fall back. Hamilton summoned him not to oppose the Scots in their "pious, loyal & necessary undertaking". July 28 1648 Lambert retreated on Bowes and Barnard Castle hoping to hold the Stainmore Pass against Hamilton. Aug 1648 Lambert retired first to Richmond then to Knaresborough. Aug 13 1648 joined by Cromwell. Aug 17/19 1648 Defeated Scots in 3 day battle at Preston. Aug 25 1648 Hamilton surrendered to Lambert at Uttoxeter. Oct 1648 Cromwell sent Lambert to Edinburgh with an advanced party of 2 regiments of horse to support the Argyll party in establishing a government. Nov 1648 Lambert to Yorkshire to besiege Pontefract. March 22 1649 Pontefract surrenders. During these military operations King Charles 1 had been tried, it was thought that Lambert approved. July 1650 Cromwell marched into Scotland. Lambert accompanied him as a Major General and second in command. July 29 1650 Royalists defeated at battles of Musselburgh, where he was wounded, taken prisoner and rescued, Leith and Burnt Island. Dec 1 1650 Lambert's quarters at Hamilton near Glasgow attacked by Colonel Ker's forces but were defeated. 1651 Charles II marched into England. Lambert and cavalry sent to trouble the enemy in the rear and try to join Harrison in stopping their advance. At Warrington they checked them for a short time. Oct 23 1651 Lambert captured Upton Bridge 7 miles from Worcester thereby the passage to the Severn and then on to Worcester. Nov 26 1651 Death of Ireton rendered it necessary to appoint a new Lord Deputy of Ireland. Jan 30 1652 Lambert appointed Lord Deputy of Ireland. May 19 1652 Parliament abolished post of Lord Deputy of Ireland. Lambert had spent £6000 of his own money on equipment for this appointment. Lambert was offered the post of Commander-in-Chief of the army in Ireland plus a position of one of the commissioners for the Civil Government. He turned down the offer considering it to be inferior to the previous appointment. He thought that Cromwell manipulated the whole affair in order to get Lambert support against Parliament. This was the beginning of the rift between them. It was commonly thought that Lambert was happy to let Cromwell continue as Lord Protector but he would rule him as he pleased. Prior to the re-election of Cromwell as Lord Protector of the 3 nations he brought up the question of kingship, apparently this had been suggested at his first election. Lambert was steadfastly opposed to it and it was commonly thought that he would raise a mutiny in the army rather than consent to it He was however in favour of the position of Lord Protector becoming hereditary, Parliament voted against it. Lambert was returned as the MP for the West Riding of Yorkshire. Cromwell was made Lord Protector of the 3 Nations. Lambert carried the Sword of State acting as the Lord Chamberlain hence he became known as Lord Lambert. Lambert refused to sign the Oath of Allegiance to the Lord Protector. Cromwell considered Lambert to be an enemy and deprived him of all his offices and employments. He feared his influence with the army so he gave he a pension of £2000 per annum. He retired to his house at Wimbledon. Cromwell dissolved Parliament but did not live lone enough to summon another. He died on 3 Sept 1658. Richard Cromwell was elected as the new Lord Protector but did not have the strength and political will of his father. Lambert, who was elected the MP for Aldborough and Pontefract, gave Richard Cromwell his support but tried to limit his power over the army. It is not clear if Lambert was involved in the "coup d'etat" which obliged Richard Cromwell to dissolve parliament on the 22 April 1659 and soon after to resign as Lord Protector. There were many factions for Richard Cromwell to contend with both within parliament and externally namely:Parliament, (Republicans, Royalists, Army) the religious groups such as C of E, RC, Quakers and Anabaptists. There was a Royalist uprising in Cheshire in Nov 1659 under Sir George Booth. Lord Lambert was appointed to take command of the army and quell it. At a battle near Northwich the insurgents were defeated and Sir George Booth captured. Lambert was dispatched with a large force to meet Monk who was in command of the English forces in Scotland. Monk had crossed the border heading south in the parliamentarian cause. Lambert was to either negotiate with him or force him to come to terms. Lambert's army fell away before Monk's southern advance and he reached London unopposed. A treaty was projected between Monk and the Council of State, which ended in the restoration of the Stuart family to the throne. Lambert was sent to the Tower in March 3 1660, he escaped but was recaptured at Daventry. Although Lambert was not involved in the trial and execution of Charles he was, in spite of efforts by the House of Commons imprisoned in Castle Cornet on the island of Guernsey in Oct l660. On Feb 17 1661 a license was granted for his wife and children to join him. April 1662 Lambert was brought to London and tried for treason. A warrant was issued to Lord Hatton, the Governor of the island of Guernsey, to keep him a close prisoner. Lambert's daughter Frances and Hatton's son Charles married secretly but Hatton was not aware of it for a year. He turned his son out of the house and cut him off with out a penny. Lambert was confined in solitary confinement. In 1667 Lambert was removed to St. Nicholas Island (otherwise called Drakes Island) in Plymouth sound at the entrance to the Hamoaze. He died during the severe winter of 1683. The site of his grave is unknown.